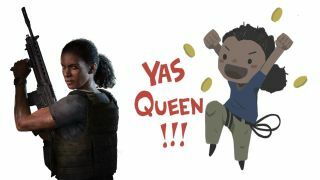 Prepare to spam your friends with tiny Nadines and miniature Chloes, because there are new iMessage stickers to celebrate the launch of Uncharted: The Lost Legacy, and they're available right now. For zero dollars and zero cents. Need to tell a friend you love them? Send them the two adventurers high-fiving. Late because of traffic? There's an angry Nadine in a jeep. Just chilling? Send a monkey in headphones. You may never need to type actual words ever again. You can find them on the App Store here. The delightful illustrations for the stickers were created by Janice Chu, who works at Uncharted developer Naughty Dog as a UI artist and illustrator. She's also worked on The Last of Us Part 2, virtual reality gallery Destinations for Valve, and The Lego Movie 2. Uncharted: The Lost Legacy is a standalone title and focuses on whip-smart thief Chloe and badass mercenary Nadine. You play as Chloe, with some serious backup from Nadine, traveling through India together to hunt down a relic called the Tusk of Ganesh. Of course, it's not just a nice sightseeing trip - the women have to deal with the brutal rebel Asav, who is also after the Tusk.